Practice your chord changes, as its a fundamental part of playing the guitar. This lesson will show you how, but it doesn't practice for you. Thats up to you! Watch the video many times, and more importantly, develop your muscle memory. You'll see that with time, these chord changes will come naturally. Sorry, but you've reached a premium content area. 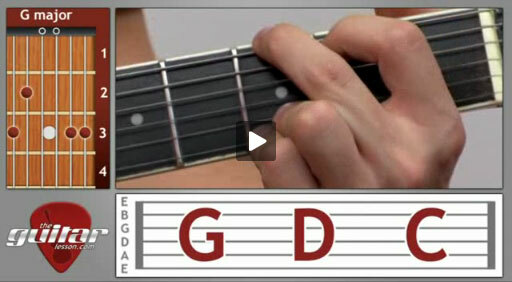 The download of the Chord Changing – beginner guitar lesson #3 tablature file is only available to premium members. Sorry, the same goes for the backing track. To download the backing track to Chord Changing – beginner guitar lesson #3, please log in and revisit this page. Hi there, no, the proper way is with your ring finger. Later on, your pinky will be doing other things, so you’ll need it free. This is a common problem though, so don’t worry about it. Just practice it the correct way, and it’ll become natural soon enough. Hi, if your kindle fire has a web browser, it should play the videos. If it doesn’t, can you tell me exactly what happens when you try?